Gardening is full of surprises, especially for a novice like me. 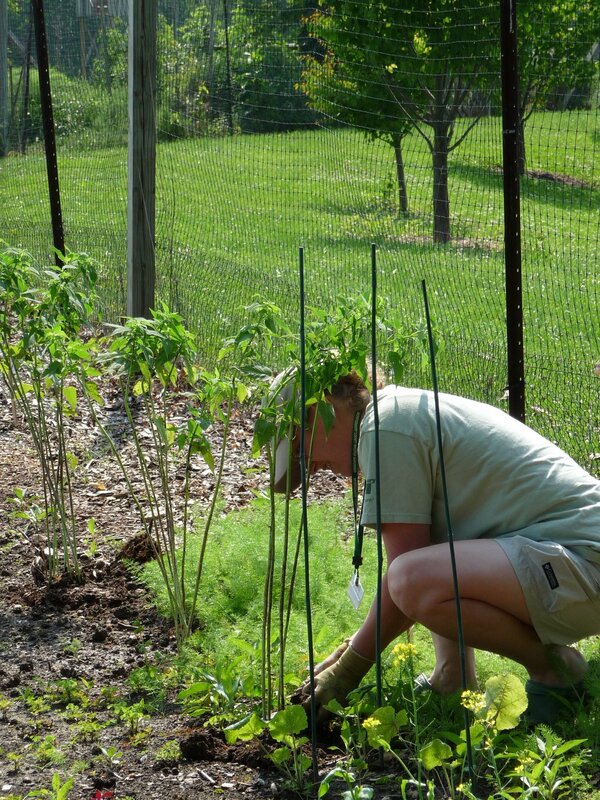 I became a Master Gardener in Washington County in April 2009. This is also my first year “seriously” growing food. For the past three years in Keedysville I grew a few cherry tomato plants and herbs. Prior to that, as an apartment dweller in Bethesda, I unsuccessfully tried to grow numerous potted rosemary and basil plants on the sunniest windowsill that I had. 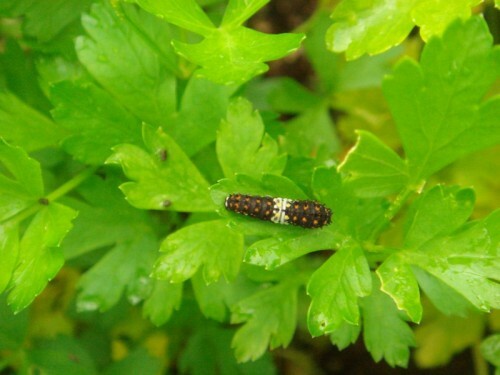 Earlier this month, while examining the four flat-leaved parsley plants growing in my new, very sunny, square foot garden (4’x4′ raised beds following the “All New Square Foot Garden” method of Mel Bartholomew), I was startled to see a caterpillar. My first reaction was, “You don’t belong on MY food! I’m going to pick you up and squish you under my garden clog!” Fortunately for the crawling creature, I’m not yet used to touching caterpillars, and I wasn’t wearing gloves. The bug was saved by my second reaction–curiosity. It reminded me of another caterpillar I’d seen last July in my native garden. 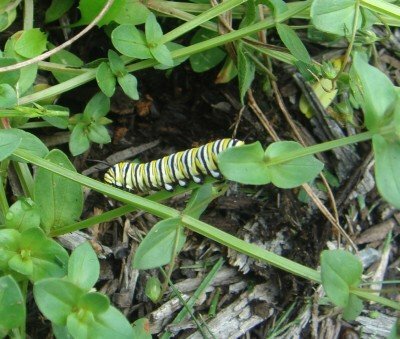 It was so striking I sent its photo to my Master Gardener friend Marney Bruce, who promptly identified it as a Monarch caterpillar. So I figured that this one might also metamorphose into an interesting butterfly, but was taken aback by a second creepy crawler on my parsley that looked REALLY weird. Annette Ipsan, Extension Educator at the Maryland Cooperative Extension (MCE), Washington County, identified the first caterpillar. 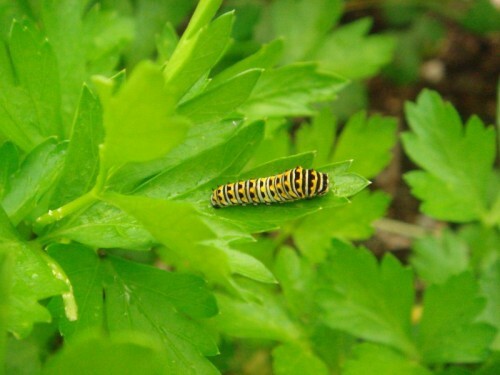 It had also shown up in the curly parsley we’re growing at the Washington County Demo Garden, and is a Black Swallowtail (unsurprisingly, it’s also known as “parsleyworm”). We think the weird one may have been an early instar–one of the younger growing phases–of the Black Swallowtail; though perhaps not, because it may be too large. Can you identify this guy? It’s not very easy to identify caterpillars, but it sure is easy to lose track of time while trying! I didn’t know there are so many different kinds of swallowtail caterpillars, or instars, or plants they use as hosts. More about Black Swallowtails here and here. Note that these caterpillars can also feed on carrots, fennel and dill. If I carefully wash my homegrown food, I’ll have delicious veggies that will be much healthier for my family than the (take a deep breath before reading this!) pesticide-sprayed-imported-from-other-continents-wilted-looking-tastes-and-smells-like-plastic stuff from the supermarket. Finely chopped as a final garnish on a heaping plate of pasta with any kind of tomato sauce, or any kind of sauce built with olive oil and garlic. By the time the plate reaches the table the fresh parsley has warmed and wilted, and its essential oils are at their maximum potency. If you’re harvesting more parsley than you can normally use I recommend Tabbouleh, a flavorful and nutritious Lebanese salad I’ve enjoyed since my childhood. The parsley can be at center stage as in this recipe, or more ingredients can be included. On a routine inspection of the vegetable garden at the governor’s mansion, I was horrified to find that the tomato plant in one of the containers was covered with mealy bugs. First off, I had never seen mealy bugs on a tomato plant. Now, they were here at the mansion. My head started spinning wondering what to do. I brought nothing to combat these fuzzy foes. And this is the mansion! It has to be perfect, right? I took a deep breath to compose myself and put on my detective’s cap. Of the four containers we planted, all had a tomato plant. All but one had herbs and flowers to attract beneficial insects. The other had a mesclun mix and a sweet potato vine planted with it. This particular container was also the one with the least amount of sun. And, you guessed it, the one with the mealy bugs. Just coincidence? I think not. Since I had no weapons of mealy bug destruction, I knew I had to return later with a game plan. As it turns out, I could not get back for two days. I returned with a bottle of rubbing alcohol, a whole pack of cotton balls and a spray bottle with soapy water. Once again, panic set in. How much damage can mealy bugs do in two days? Should I have brought a hazardous materials suit like the fire department wears? Maybe I should have brought new plants as replacements. Do you think anyone would notice if I just repotted the container? As I turned the corner, I expected to see one big massive mealy bug ball of fuzz. To my surprise, I could still see a tomato plant, a sweet potato vine and mesclun mix. When I got up close, I could still see mealy bugs but there was no additional damage. I armed myself with the alcohol and cotton balls and went to work. Somehow, I found great pleasure in eradicating them one by one. Wait a minute, why does that one look so funny? Then it hit me. As a Master Gardener, I find myself at plant clinics telling people not to panic. Beneficial insects will come. I took a break from my high speed killing frenzy to once again make a thorough examination. I discovered an army of lacewing nymphs happily consuming my fuzzy little nightmares. They were grabbing them by the throat and sucking the life out of them. Okay, maybe that’s a bit dramatic but I suffered through two days of agony because of those mealy bugs. Although the nymphs were doing a fine job, I still could not resist wiping out a few more on my own. Sorry fellas, you can’t have them all! 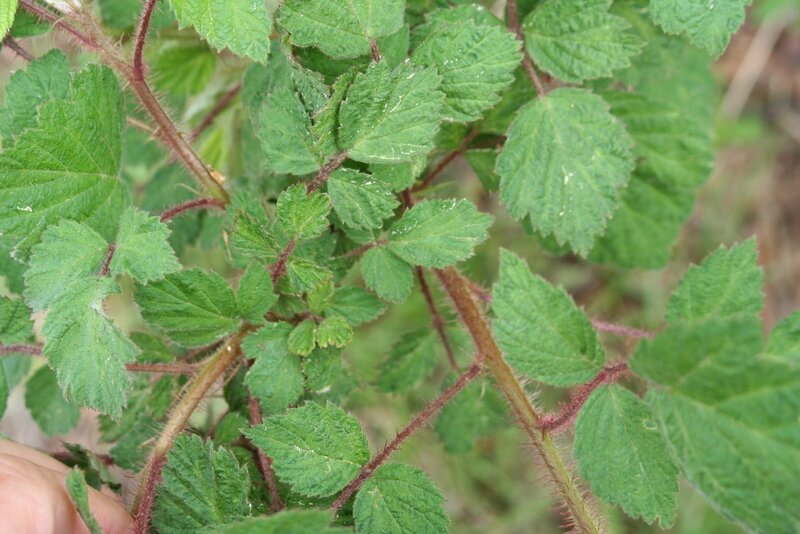 Wineberry (Rubus phoenicolasius)is an Asian bramble species that produces luscious fruit in mid-summer. I know gardeners who have discovered the plant in wild and semi-wild areas, tasted the fruit, and then propagated the plant in their landscapes from root cuttings. BIG MISTAKE! This exotic invasive prefers wet areas and can be found choking out native plants throughout Maryland. You may be able to manage it in your landscape but animals will spread seeds far and wide. Cut it down or treat it with a systemic herbicide (glyphosate, triclopyr) if you find it on your land. Plant blackberry, raspberry and blueberry if you’re looking for delicious fruit that won’t get out of control. 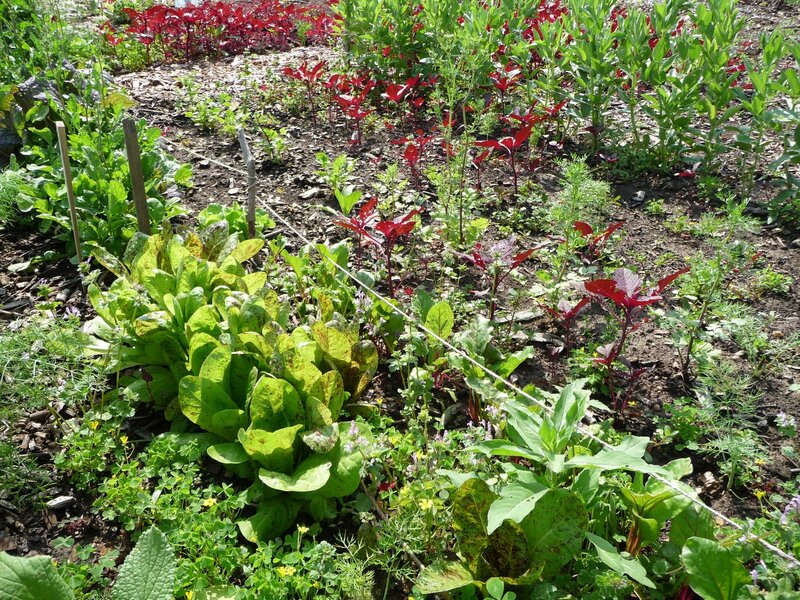 Many Master Gardeners have related successful experiences with the lasagna garden method of creating new garden beds. Pat Lanza has popularized these techniques in her books, which I am determined to read. 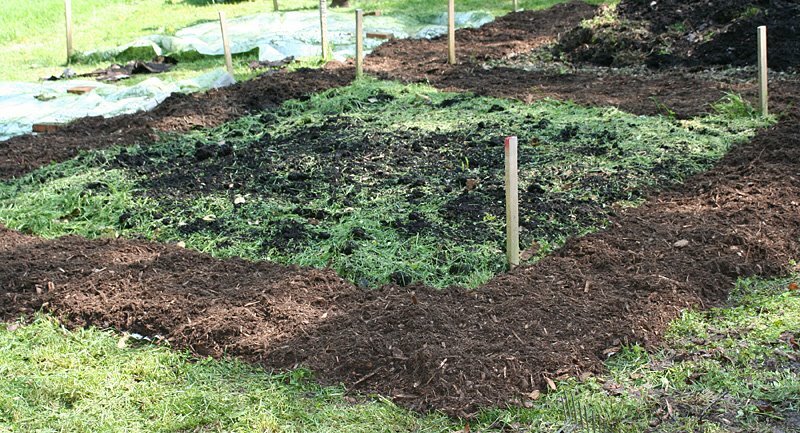 The concept is simple: cover areas of turf with newspaper or cardboard and then apply layers of organic materials, like shredded leaves, grass clippings, and compost. Over time, everything breaks down and so that you can plant seeds and seedlings directly into the bed without digging and turning the soil. This fits perfectly with sustainable gardening- build up and conserve organic matter and prevent soil erosion and nutrient run-off. The added bonus is no weeds! But as a person who loves to see, smell, and feel soil, I was having a bit of a tough time embracing the concept. Well, we put it to an initial test this spring in one of the 4 new beds at the Grow It Eat It demo garden at the Central Maryland Research and Education Center in Ellicott City. Newspaper was laid on an 8-ft. X 8-ft. area of turf in April and then covered with a 2-in. layer of LeafGro- a commercial yard waste compost. This picture was taken May 8. The grass clippings on the bed are from weed whacking the walkways (we then covered the walkways with shredded pine bark mulch). The edges of the newspaper are still visible. June 12- bush bean, Swiss chard, kale, and cucumber were direct seeded in the LeafGro in late May, and are growing well. There are no signs of the newspaper or turf, other than decomposing roots. Linda Branagan is the Howard Co. Master Gardener tending this demo garden. We’ll report on yields later. For now, I’d give this method a big thumbs-up. Hello! Here’s a much belated report from the Derwood Demo Garden in Montgomery County, delayed by the demise of my old computer and the adjustment to a new one. Luckily most of my files were backed up, but I still have to make occasional forays into the old hard drive to retrieve data in the five minute intervals I’m allowed before the machine shuts down on me again, which is sort of like making little runs out into the garden to get something done in between rain storms, though not very much. We’ve actually been pretty lucky in the demo garden this rainy spring, as most of our work days haven’t exactly been rained out, just dampened slightly… well, during part of the last one what could have been described as mist when we got there turned into something a little more like water forming definite drops and succumbing to the force of gravity pretty hard, but, we kept telling ourselves, those of us who were still there when we looked around, it was Not Rain. And then the Not Rain cleared up, and the sun came out, and it got rather hot and humid, and guess what we’ll be complaining about for the rest of the summer? Anyway, the weeds are doing very well this year. Both the traditional weeds like thistle and deadnettle and ground ivy and wood sorrel and whatever the tall thing with the white flowers behind the fence is, which are the fault of the universe, and the plants in the wrong place that can’t be blamed on anyone but us. Fennel, first of all. Someone (ahem) has been too indulgent with fennel. But no more. See this little patch of it among the tall bee balm plants I’m putting in? That’s all we are allowing ourselves this year. It looks harmless enough now, but just wait till August when it is five feet tall and, if we let it have its way, covering the entire garden. It tastes great, it is a great attractor of butterflies and other beneficial insects, and it’s pretty, but I am cutting the tops off before it goes to seed, and we’ll still be digging it out all over for the next few years. And that was after we thought we’d weeded. It looks like that every week. It is not, I note, so pretty when it gets five feet tall (note a theme here?) and turns kind of greeny-red and falls over. Grow it, or its relatives (I, er, actually put in Amaranth ‘Illumination’ last week in the Edible Beauty bed), but let them die young and lovely. At least we know better than to grow mint. Don’t let plants go to seed if they have a reputation for being promiscuous. If you don’t know, play it safe. Of course your gardening friends will tell you that such-and-such never self-seeds and then it will, all over your garden, laughing, but that just means you have better soil and a more welcoming environment than your friends, so you can feel good about that while you weed for hours. Also watch out for things with taproots or roots that leave bits of themselves in the soil when pulled (or get chopped up when tilled). Don’t leave them in your garden and don’t put them in your compost. The second part of that is pretty easy. Cover your soil! There are many options. I like the low-tech newspaper and leaf-mulch method. Don’t be afraid to use full sections of the newspaper at once. This is difficult if you have already switched to the online edition, however. Speaking of visiting, anyone reading this is more than welcome to visit our garden; it is open at any time the park is open. Directions here. We work Thursday mornings from 8 to noon, but if you would like a tour at another time please email mc.growit@gmail.com and we’ll see what we can do. My name is Dale Johnson and Jon ask me if I would like to contribute to this “Grow It! Eat it!” blog. I jumped at the chance because I love gardening. I am not a Master Gardener (I will be some day) but each year I learn more and I would love to share my experiences – both successes and failures. I also have chickens – layers and broilers – which are a great complement to gardens and I might occasional sneak in an article on them. After all, I grow and eat them too! I will start off my blogs with both a success and a disaster. My family is proud of our garden. It is productive and beautiful. We were bloated with spring crops – salads, cooking greens, onion, broccoli, cabbage, etc. Our summer crops reach for the sun promising tomatoes, peppers, beans, cucumbers, and squash. It all came crashing down last week. Much of it was eaten to the ground. Particularly distressing was the damage to the peas. We were just starting to harvest them. We only got a couple of bowls full from gleaning the remnants. I am optimistic that our garden will rise from this apocalypse. I will eat tomato and cucumber salad, green beans with bacon, and squash frittata. We will have a successful garden in 2009. 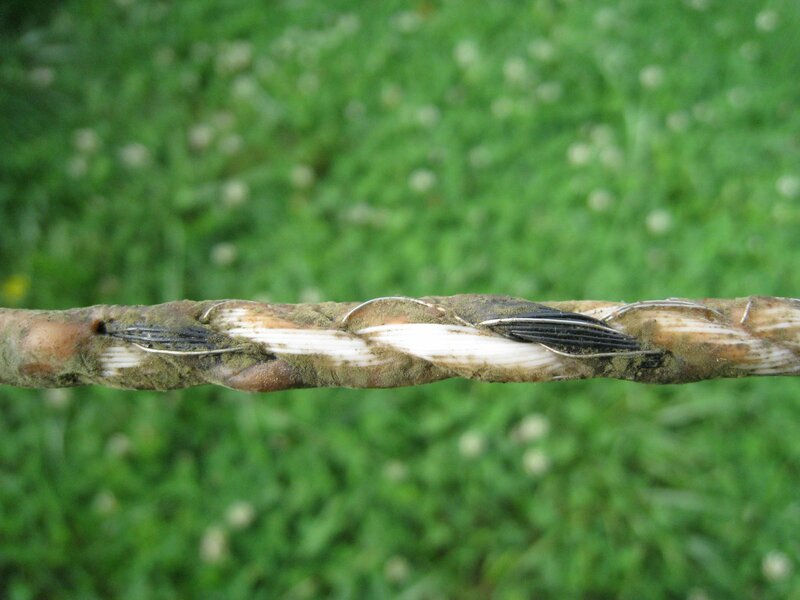 Peanut butter/vegetable oil deer attractant on polywire rope. Notice the bare wires that carry a 4000 volt charge. I grow food at the Master Peace Community Farm in Prince George’s County. We have sandy coastal soils, which is often the case for most Marylanders east of Interstate 95. Starting about the middle of June (right now! ), these sandy soils can harbor my arch rival and gardening nemesis: Bermuda grass. I want to share with you how to rid your garden of this horrible weed without relying on herbicides, and how to keep it out of your garden so that you can get on to better things in life, like growing food! Bermuda grass is an especially feared weed because it reproduces by underground runners that poke out the ground elsewhere, creating a network that can quickly take over a garden. Unless you get it all up and out of your soil, you’re just buying yourself time until it comes back. There isn’t one product that you can buy or one way to deal with Bermuda grass, you have to understand its weaknesses and get ‘em where it hurts. With these simple steps, though, you will prevail over one of our most feared weeds. 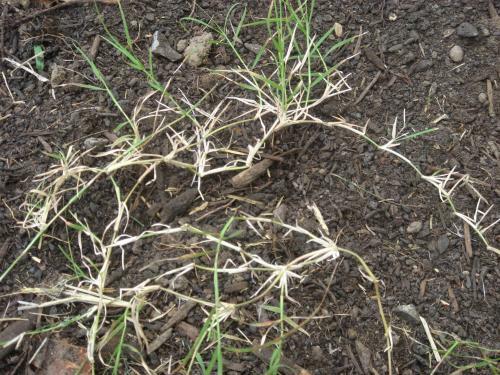 Bermuda grass loves full sun, and won’t thrive in the shade. Also, you learned that it reproduces not with seeds but with underground runners. Therefore, dealing with Bermuda grass can be broken into two areas: 1) Get it up, and 2) Keep it covered. Get it up Most weeds you pull and, well, they’re gone. Not with Bermuda grass. I suggest that you dig into the ground where it is, preferably with a digging fork, and loosen all the ground around the weed. Then, pulling up all the soil around it, you can then shake off the roots and get it out of your garden. If you leave any bit of root in your garden, it will continue to grow. While we like to encourage composting of all your garden waste, you may want to throw it away in the trash instead. Unless your compost bin is very hot and well managed, it can often survive the process and be put back in your garden when you spread your finished compost. Keep it covered Once you have it up and out of your garden, you want to keep it that way. Immediately mulch the area. If it’s a path, use high-quality contractor-grade landscaping fabric under the mulch. If its in a garden bed, use non-glossy newspaper, whole sections at a time, overlapping, which will decompose over the growing season. Then, cover the area with lots of leaves or wood mulch. The best way to keep it from coming back it to shade the area. 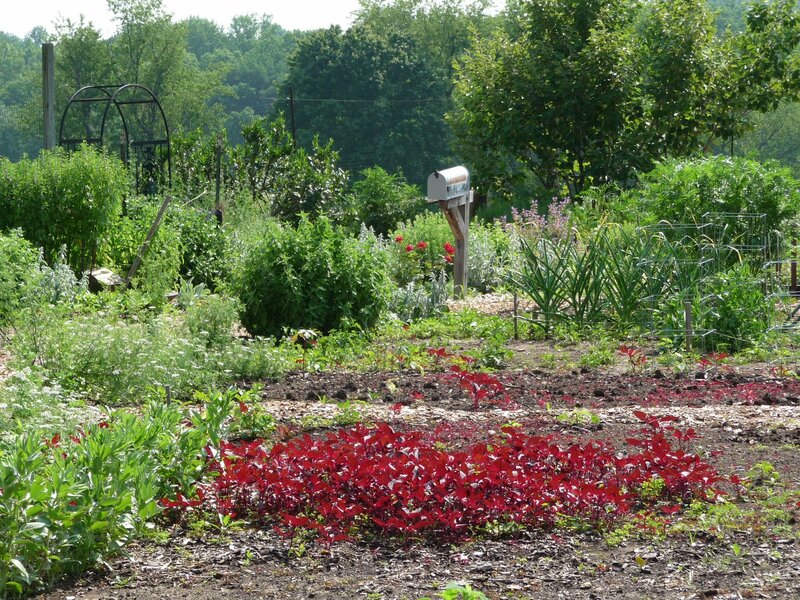 We do this at the Master Peace Community Farm by growing plants in that area. 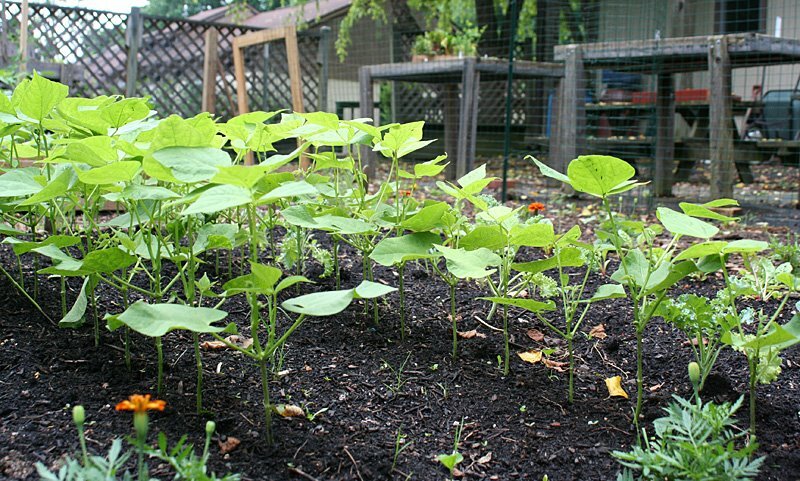 Plants like beans are great, they grow quickly and within two or three weeks create a thick shaded area. Marigolds also do a great job. We use plants like these on the boarders of garden beds and grass to prevent it from creeping in from the sides. Bermuda grass might seem like an impossible barrier between now and harvesting, but it can be overcome. Be persistent and proactive, it can be done!